Scarf measures approximately 5" wide x 51" long. Headband measures approximately 20" around, fits most women. MODA DEA™ "Chichi", Art. R109 (1.76 ounce/83 yard ball): 2 Balls No. 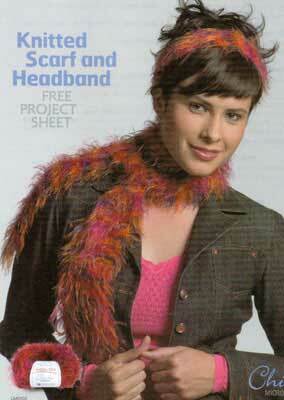 9946 Flamingo for both scarf and headband. Knitting Needles: 6.5mm [US 10.5] for scarf; 4.5mm [US 7] for headband. Yarn needle. GAUGES: 16 sts = 4"; 18 rows = 4" in Garter stitch (Knit every row) for scarf with larger needles. 14 sts = 2"; 18 sts = 2" in ribbing for headband with smaller needles. CHECK YOUR GAUGE. Use any size needles to obtain the gauges. With larger needles, cast on 20 sts. Knit every row until approximately 51" from beg. Bind off. With smaller needles, cast on 6 sts. Knit every row until approximately 4 ½" from beg. Next Row: Knit into the front and back of each stitch across - 12 sts. Next Row: Knit into the front and back of first st. K10, knit into the front and back of last st -14 sts. Next Row: * K1, P1; rep from * across. Rep last row for ribbing for 14 ½", or until piece measures approximately 19 ½" from beg. Next Row: K2tog, K10, K2tog - 12 sts. Next Row: * K2tog; rep from * across - 6 sts. FINISHING: Sew cast-on and bind-off edges together to form a circle, being careful not to twist headband. Weave in ends. Headband Designed by Margaret Drake. ABBREVIATIONS: beg = beginning; K = knit; mm = millimeters; P = purl; rep = repeat; st(s) = stitch(es); tog = together; * = repeat whatever follows the * as indicated.